A treat to live in, is the exclusive residential apartment project Excella Kutumb, coming up in the fast developing area of Lucknow, Sultanpur Road.This RERA certified project has on offer elegant 2 and 3 BHK apartments of varied configurations and the unit sizes varying from 900 sq. ft. to 1095 sq. ft.Being developed by the leading builders of North India,Excella Group, the gated community is sprawled across a whopping area of 6 acres of prime urban land and contains a total of 750 luxurious units. Set amidst landscaped greens and enchanting water bodies, Excella Infra Zone will provide an unmatched lifestyle of leisure and well-being with enticing amenities like a stylish clubhouse,a modern gymnasium, cycle track, education centre, a yoga centre, and various indoor & outdoor games facilities. The inhabitants would have a life of comfort with 24-hour power back-up, ample water supply, a multi-level security, intercom service, and CCTV surveillance. The inviting apartments with ample natural light and ventilation would have plush interiors with modern modular kitchens (with RO system) and many safety features. The neighbourhoodand surrounding environment is upscale and vibrant. Within easy access from this property are many reputed hotels, schools, malls, shopping centres, restaurants, and hospitals. In close proximity arefamous landmarks like Indira Boys & Girls School, Shiva Public School, Katra Bakkas Hospital, and Sahaj Polyclinic. 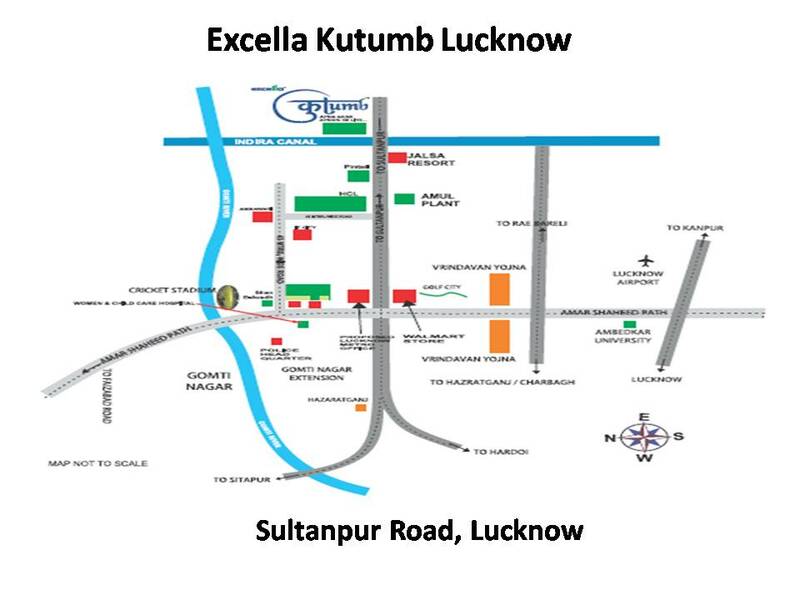 Ideal for first time and budget home buyers, Excella Kutumb Lucknow has prices ranging from Rs. 24.30 lakhs to Rs. 29.56 lakhs. The buyer’s interest has become of prime importance and has been safeguarded with the implementation of RERA. Also, projects would be delivered on time with minimal disputes in the realty sector. This property being RERA certified is a safe investment option. Young urban professionals would benefit immensely by investing here as the investment would be a great opportunity for high returns and financial growth. They would also live an elevated lifestyle full of envious amenities!